← What has the world come to? Hubby is gone again. You’d think a military spouse would get used to it, but sometimes it catches you off gaurd. Especially when this is supposed to be his shore time. He’ll be back any day now, and I am really excited about that. My puppies always misbehave really bad when he is gone. I mean like Mr. Blackjack lets them all out the back gate, or pulls all the tuperware off the counter so they can have a feast. The two new puppies love baby diapers and have figured out how to open the diaper genie. What’s the point of having a genie if it doesn’t keep the pups out? Domino just gets into every bit of trouble the others do. They even managed to knock over my blood orange tree. I’m a little mad about that. I’m going to have to get new potting soil now. Not to mention Mr. Blue Eyes will only say mama when he’s mad at me, and cries for dada nonstop. I pulled down daddy’s picture and that seems to help. I may have to get a daddy doll and one of those book recordings. Just something so daddy is around. He does love when daddy gets on the phone though. So other than school, and naughty dogs, I’ve been taking advantage of the season to make COOKIES! I must admit, I may not be the greatest cook, but I LOVE to bake. I love making cookies, and cakes, and an occasional pie. With christmas coming upon us, I had my friend over to make cookies with me. We didn’t get very far. We made peanut butter cookies and red velvet cookies. I’m not sure where I went wrong with the peanut butter cookies, but they were slightly flatter than normal. I may remake them. Mr. Blue Eyes sure loved them though. His first real cookie. He’s been zooming all around the house with half a cookie, treating it like gold. Of course there is a small herd of puppies following him around waiting for any signs of dropping crumbs. As far as the red velvet cookies go, I may be in love. They were delicious. I meant to take a picture, but instead you get the sole surviving cookie. 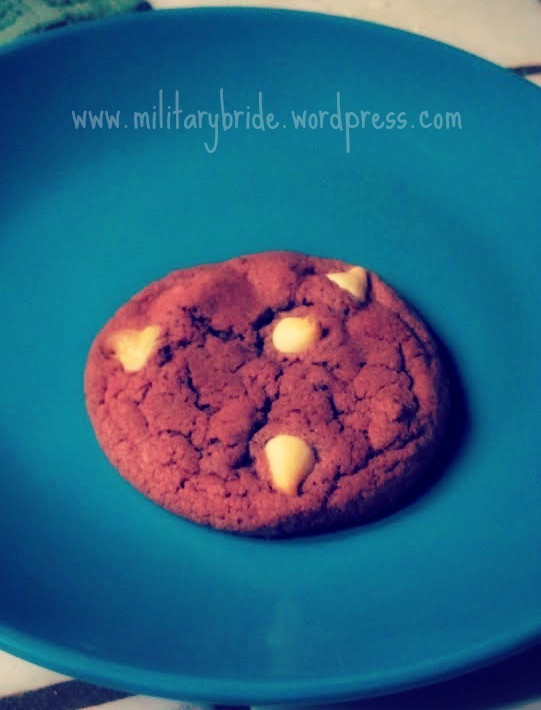 In my search for the Red Velvet Cookie, I came across this amazing lady’s blog about food. It’s called Cooking Classy, and I’ve loved all the recipes I’ve tried so far. cookies in an airtight container. chocolate chips with chocolate chips.